For courses in Quality Management. 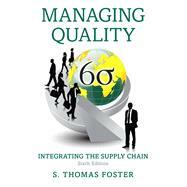 Foster’s Managing Quality: Integrating the Supply Chain, Sixth Edition offers readers a thorough introduction to quality management by presenting a supply chain theme as the unifying framework for quality improvement. The supply chain thread enhances the integration of systems with customers, suppliers, technology, and people. The colorful, stunning text appeals to visual learners and grabs readers’ attention at the outset. The Sixth Edition elicits a theme of “currency” while offering updated vignettes and references to remain state-of-the-art. The new edition is selectively edited and enhanced with new content that maintains its scope and withstands pivotal points in each section. Managing Quality keeps a competitive advantage by sustaining and building on cutting ¿edge, relevant topics in quality management. Dr. Tom Foster is a professor, researcher, and consultant in the field of quality management. Among Dr. Foster’s areas of expertise are strategic quality planning, service quality, Six Sigma, government quality, and the role of technology in improving quality. Tom is the Donald L. Staheli Professor of quality and global supply chain management in the Marriott School of Management at Brigham Young University. He has also taught at Pennsylvania State University and Boise State University. He received his Ph.D. from the University of Missouri-Columbia. Dr. Foster has professional experience in manufacturing, financial services operations, and international oil exploration. He has consulted for over 30 companies, including Trus Joist MacMillan, the U.S. Department of Energy, Hewlett-Packard, Heinz Frozen Food, and Cutler Hammer/Eaton Corporation. Dr. Foster currently serves on the 12-person Board of Overseers for the Malcolm Baldrige Award and has served as a judge for state awards. Tom is on the editorial boards of the Journal of Operations Management, the Quality Management Journal, and Decision Sciences. He has published over 80 quality-related research articles in journals such as The Journal of Operations Management, Decision Sciences, the International Journal of Production Research, the Quality Management Journal, and Quality Progress. He is listed in Who’s Who in America and Who’s Who in the World. Dr. Foster is founder of www.freequality.org, was awarded the ASBSU Outstanding Faculty Award, and served as guest editor for the Journal of Operations Management and Quality Management Journal special issue on supply chain quality. In addition, he was winner of the 2002 Decision Sciences Institute Innovative Education Award. Foster is co-author of Managing Supply Chain and Operations from Pearson. Tom has ten children, 9 grandchildren, and is married to the former Camille Curtis. In his spare time, he skis, enjoys the Rocky Mountains, and plays his Gibson Les Paul Custom.